By John Seiler, Former Editorial Writer at the Orange County Register. The biggest fiscal challenge facing California remains underfunded pensions. Ed Mendel’s Calpensions.com site featured a great chart showing how CalPERS’ current 75 percent level of funding has failed to repeat two previous restorations of value to above 100 percent. That article comes shortly after the fund reported its lowest gains since the Great Recession. Why is this happening? I think there are two reasons. Of course, CalPERS invests in many other sectors of the economy than those tracked by the Dow. But the point is the Dow is one indicator that the whole U.S. economy is not performing well at all. At the recent conventions, not only Donald Trump and other Republicans decried the sluggish growth of recent years. It shows the funding level soared above 100 percent in the late 1990s, as the dot-com economy boomed. Then it slid below 100 percent, I believe, for two reasons: The dot-com economy went bust (shown as well in the first chart, above). But that also was the period of pension spiking, such as by SB 400 in 1999. I wrote numerous editorials in the Orange County Register at the time warning this would become a disaster. Which it now has. 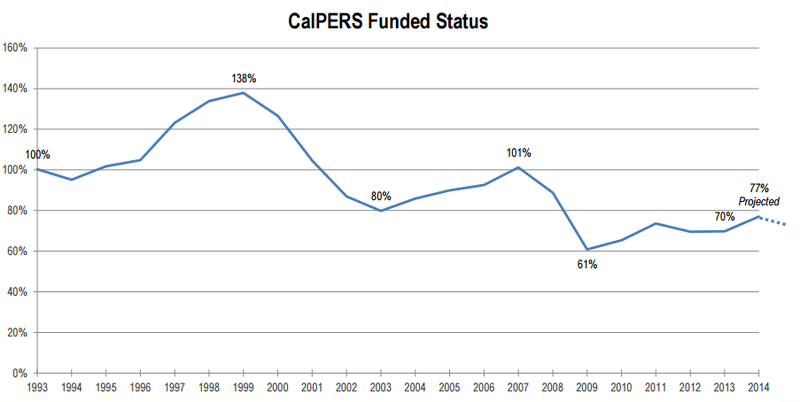 CalPERS last inched above the 100 percent funding level in 2007. That was the height of the fake real-estate boom, which soon crashed into the Great Recession, slamming not just real estate in California, but everywhere; and taking down the stock markets as well. If you look at the chart, the last “normal” year before the boom, 2003, saw CalPERS funded at 80 percent. And since 2011, when the recovery began, it’s been at around 75 percent. That 75 percent to 80 percent funding during recoveries is the “new normal,” with the fund dipping even lower during recessions. A commentator on the Calpension site also noted, “The primary reason pension funds can’t meet the 7.5% target is because of QE [quantitative easing]. QE has pushed interest rates to near zero making it impossible for pension funds to get returns on bonds. Back in 2000, you could load up on 10-year Treasuries all day yielding 6%. Add some dividend yielding stocks and making 7.5% was a walk in the park. If we had 6% rates on government bonds today pension funds would be in great shape. Actually, QE was the inflationary policy of the late 2000s. The commentator actually is referring to ZIRP – the zero interest rate policy, which indeed has hurt bonds. However, this is not a “federal policy,” but a Federal Reserve policy; and the Fed is supposed to be “independent,” at least on paper, and so far has resisted attempts by some in Congress, such as former Rep. Ron Paul, for a decent auditing. Moreover, ending ZIRP would mean U.S. taxpayers would have to pay much higher interest rates on the $19 trillion national debt. This is the problem that ensues when governments run up huge debts. Although more sensible, Reaganomic-style economic growth policies by the Fed and the U.S. government obviously would help, the pension spiking remains the major reason CalPERS is underfunded. In the end, you know who will get hit for the expense: the taxpayers.